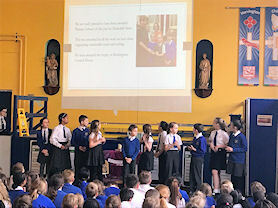 Our Stewardship Team introduced our Monday assembly this week, sharing news of their most recent activities and successes. We received lots of feedback from parents at our information stall during parent's evening and the main points were shared with school. The team also shared details of their latest initiative 'Wands for Wildlife'. Stewardship Team are asking that children bring in used, clean mascara wands that can be used by wildlife sanctuaries for cleaning and grooming injured and abandoned wild animals. Our team after the big clean up. The Stewardship Team are always thinking about the responsibility we all have to look after our world. 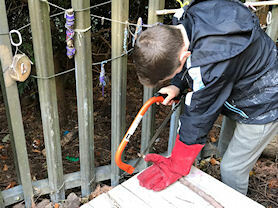 After noticing rubbish in areas around the perimeter of our playground and forest area, our pupils signed up to take part in 'The Big School Clean Up', a national campaign by Keep Britain Tidy. 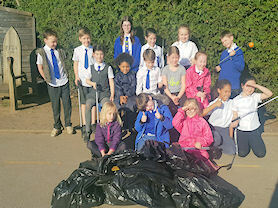 Staying after school, our faithful Stewardship team filled ten bags with rubbish. The session was such a success, we are already planning our next event. Our staff members with Sally Phillips. Our Speech and Language Lead and SENCo were honoured at the opportunity to attend the Shine a light Award ceremony in London as a finalist in the Primary School of the year category. This award recognises and celebrates innovative work and excellent practice in supporting children and young people’s speech, language and communication development. 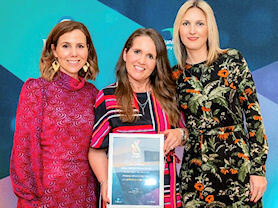 The Abbey Catholic Primary School received a Highly Commended award presented by the comedian Sally Phillips. Speaking about the winners, Sally said: "As a nation, it is vital that we ensure that all children have the opportunity to express themselves, particularly when this ability has a profound impact on our future life chances. The amazing winners and highly commended finalists of the Shine a Light Awards prove what a difference we can make if we become informed, impassioned and engaged in the speech language and communication needs of those around us. "These inspiring individuals and teams don’t just change the lives of one person, their tireless work impacts entire communities in their region, across the UK and for some, across the world. I have seen for myself the huge difference expert intervention and support provides for children, like my son Olly particularly at a time where we face a nationwide shortage of speech and language therapists." Also presenting at the awards was Britain’s Got Talent Winner, Lee Ridley (known as Lost Voice Guy), who has cerebral palsy and uses AAC, via voice software on his IPAD to communicate and express himself, said: "I may not be able to speak but I most certainly have a voice. It is heart-warming to know there are so many teams and individuals across the country that are dedicated to ensuring children and young people’s voices are heard and I am pleased they were recognised at the Awards." School leaders with our Swedish guest. During the week beginning the 10th March 2019 we welcomed a Swedish Headteacher on a work shadowing opportunity through the Erasmus program. As part of the Birmingham Catholic Primary Partnership we welcomed several Swedish school leaders to our city. We were delighted to show our visitor, who is from a school in Vastaras, Sweden, around our school and city. We found time after school to take our visitor for traditional English afternoon tea and fish and chips! She had a wonderful week. We look forward to continuing relationships with our two countries and schools. Today was International Women's Day. As a school we celebrated through class discussions and activities, before joining as a whole school for a celebration assembly. The day was about joining together and remembering the women who fought for equality in our world. The theme of the day was about balancing and children actively took part in pretending to be the scales of society and showing how in modern Britain we are striving to have a balanced world for all individuals. "I believe everyone is equal and that girls should have the choice to be what they want when they grow up." "I really enjoyed looking at strong women who I can look up to, in my school, at home and celebrities." Thank you to all the adults who helped make the day a success. Year 1 children at Waterstones. Year 1 enjoyed their journey into town to Waterstones. Whilst they were there they enjoyed sharing stories with their friends, having a tour of the book store and choosing a classroom reader. 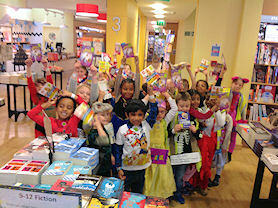 Each child in Year 1 chose their very own book to buy with their world book day voucher. Needless to say it was a quiet journey home. Pupils working on their interesting ideas. Abbey Catholic Primary School are very proud that leadership at all levels is fully embedded throughout school. This includes pupil leaders. 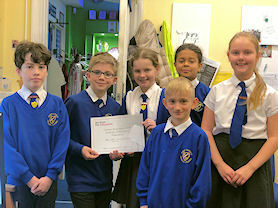 In March 2019 our Year 6 pupils were involved in a review of our school. Pupils worked collaboratively to decide which aspects of school they would like to keep, improve, start and stop. Lots of interesting ideas were shared and some of these will be included in the school improvement plan for 2019/20. Some ideas were fabulous but unfortunately beyond budget capabilities. This was also an area discussed with pupils. The next stage is for two of our pupil ambassadors to lead a school review with Pupil Parliament. Enjoying one of the comedians. 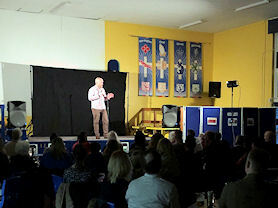 On Friday 1st March 2019 our PTFA organised a fabulous night of comedic entertainment to raise funds for school. Parents were entertained by three excellent comedians and enjoyed a relaxed evening’s entertainment with refreshments and great company. The evening was a great success. Many thanks to all who organised and supported. Receiving our Modeshift Stars award. 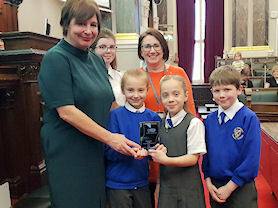 We were thrilled to receive the award for Best Primary School from Modeshift Stars, which was presented at Birmingham Council House by Councillor Jayne Francis. This award recognises all our initiatives towards encouraging safer and more sustainable travel as a school community. Members of the Stewardship Team at the Council House. We were happy to be invited to take part in the Brum Breathes summit at the Council House. The summit took place in the Council Chamber, where we heard from many speakers who explained passionately how important it is that we deal with the issues around pollution. We took notes, asked questions and came away with lots of initial thoughts about how we can do our bit to help. We also got the chance to meet with other schools and talk to them about their initiatives. We are planning our next steps as Stewards of God's creation. Learning more about trains and railways. 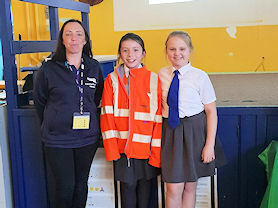 On Monday we had an assembly presentation from Network Rail which was all about how to stay safe around the railway. Lisa gave us lots of interesting information about trains (they weigh as much as 80 elephants!). We were shocked that it takes the length of 20 football pitches for a train to stop. Now we know about all the hazards we know how to keep ourselves safe. Network Rail have a special story book called 'Stay Safe with Thomas', you can download it for free at www.networkrail.co.uk/thomas. Two of our school ambassadors with Ms Tallon. In Spring term 2019, two of our school ambassadors evaluated their own roles in school and came to the conclusion that they weren’t being proactive enough. 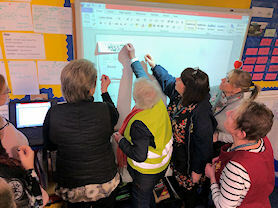 As a result of this, they booked an appointment with the Headteacher and have drawn up a plan of action for how they can take a lead in important decisions for our school. So far they have been involved in a review of lunchtime provision with lunchtime staff, have ordered gold ties for our new reward system and have booked in a staff briefing session where they will be presenting ideas to staff. We are incredibly proud of these young people and the positive strides they are taking to make the Abbey a better place for everyone. Some of our musicians at the Chamber Music Festival. 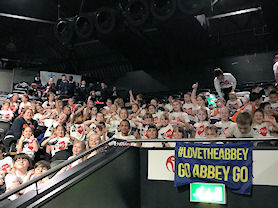 On 11th February 2019, representatives from our 180 piece Abbey brass band attended the Chamber Music Festival. We are really proud to work with Services for Education to be a part of this city wide Chamber Music Festival. As school budgets are increasingly reduced, we are thrilled that, for now, we are still able to provide brass instrument lessons for all pupils in Years 4, 5 and 6 at no cost to families. During the Autumn term, children from Years 4, 5 and 6 took part in the first photography club, held at the Abbey. The children looked at how to set up a background, use lighting, use the rule of thirds, take a portrait of someone and photograph inside the Abbey Church. The children chose their favourite three photos to be displayed in school. Parents and family were invited in to open the exhibition. 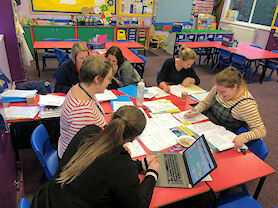 On Wednesday 6th February 2019 teachers from Wylde Green Primary School joined us at Abbey to moderate writing. Teachers from every year band compared pupils written work against age related standards. Everyone found the opportunity very supportive and we look forward to repeating this again in the Summer term. On 29th January 2019 we met with lunchtime staff and pupil representatives to review lunchtime provision. Everyone worked incredibly hard discussing what we wanted to keep, improve, stop and start during lunchtimes. We are very proud of our amazing lunchtime staff and the fabulous leadership at all levels that constantly strives to ensure provision at the Abbey is the very best. Choir at the Resorts World Arena. Choir have spent the last term learning lots of new songs and some dance routines ready for taking part in the Young Voices Concert. Our concert was at the Resorts World Arena, where we were part of a choir of 6000 children! We were supported by lots of professional singers including Tony Hadley and the Urban Strides dance group. We had an incredible day and were delighted so many parents and family members came along to watch and support us. 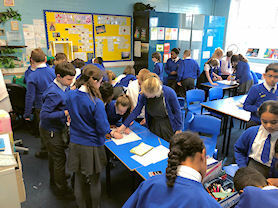 On Tuesday 22nd January, children in Year 4 welcomed their family members to a Maths Workshop based around times tables. Many different techniques to learn times tables were shared with the families and the children taught their families an exciting finger trick to help them learn their 6, 7, 8 and 9 times tables. The session ended with children accessing Times Tables Rockstars on tablets so that they can continue practising using this at home. Thank you to everybody that came along to support the children and for your continued support at home. 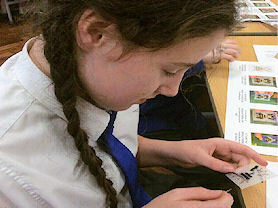 A crowd of families gathered together to join their children in a maths workshop based around times tables. They played games and used tablets to access resources in the internet in order to make learning tables more fun. Keep up the hard work Year 3! Year 6 parents in school. 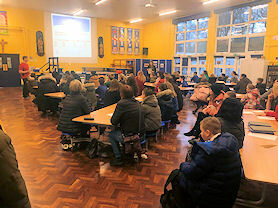 On 16th January 2019 our school hall was full of Year 6 students and parents. Our Year 6 staff team shared top tips and helpful web links to help prepare pupils for the Key Stage 2 tests. If you need further help supporting your child, don’t hesitate to contact your child’s class teacher. Year 6 learn from the visiting youth worker. Ken, who is a youth worker in Erdington, spoke to Year 6 pupils about anti-social behaviour. He explained what this was and what happens when young people are referred to him. 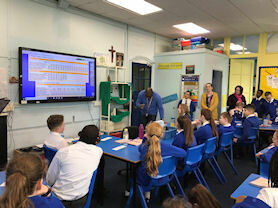 The Year 6 pupils asked many interesting questions and were really engaged in the topics being discussed. 2KR about to enjoy making and eating pizzas. 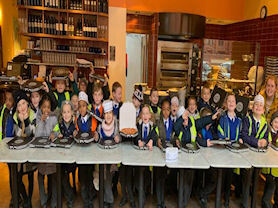 2KR had a fantastic morning at Pizza Express in Birmingham to start their new topic - We Are What We Eat. After an exciting bus journey into the city centre, the eager pizza chefs entered the restaurant. After washing our hands and putting on hats and aprons, Year 2 stretched dough, spread on tomato sauce and sprinkled on cheese before the expert chefs placed them in the pizza ovens. Year 2 were then lucky enough to eat their own pizzas at lunchtime. Thank you so much to Pizza Express and our parent helpers for making this possible! 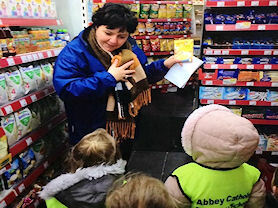 Reception children at the Polish shop. During Multi-Faith Week Reception found out information about Poland. They visited a Polish shop to buy food and juice for snack time. The children found it fascinating to see different types of food and also the different lettering on packaging. Each group purchased an item to share, this include Polish sausage which was a very popular choice. Many children were eager to take their parents there to buy some of the food they had sampled. 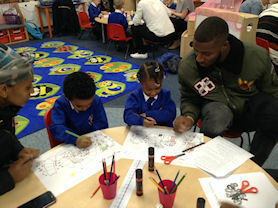 Reception children at the MAC. Reception had an amazing time at the MAC theatre production of Rudolph. The children watched with excitement as the characters were brought to life on stage. They had the opportunity to interact with the characters throughout the performance. What a fantastic experience this was for all children! 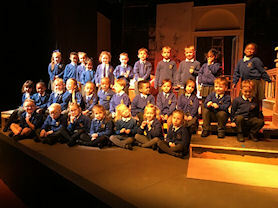 Children in Years 1 and 2 enjoyed an afternoon of laughter and music as they watched Pinocchio at The Old Rep theatre. The children were excited to join in with the dancing and clapping and Year 1 sang along to the song they learnt during their theatre workshop ... Blue like the sky, blue the seas. Blue like the moon and blue dungarees. We welcomed the Lord Mayor of Birmingham. 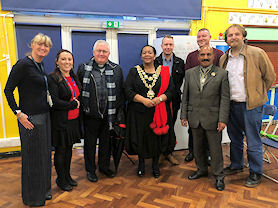 In December 2018 we were thrilled to welcome the Lord Mayor of Birmingham and her consort to our school. The Lord Mayor enjoyed the Reception pupils Nativity and spoke to parents and grandparents. The Lord Mayor reminded parents how quickly time passes and urged them to enjoy the time whilst their children are young. The choir in their Christmas Celebration. Our wonderful choir came together to mark the end of the year with a Christmas celebration. 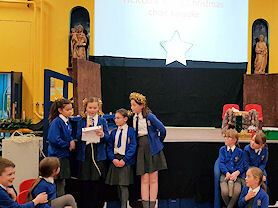 Children have worked really hard learning and performing songs for our Advent Carol Service and enjoyed this was an opportunity to celebrate their success. We enjoyed a Christmas Karaoke and some treats and are looking forward to the New Year and more singing! Some of our donations for the Dogs Home. 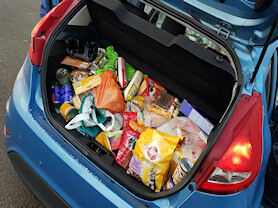 On Friday 14th December 2018 pupils wore their ‘own clothes’ to school and donated dog and cat food for Birmingham Dogs Home. Thanks to Mrs Barton for coordinating this and thanks to our families for their generosity. Working on our tapesty projects. We are delighted to be one of a handful of schools chosen to participate in an exciting new community art project 'Bee Yourself'. 30 of our pupils spent the afternoon working with professional Tapestry artist Tina Francis to create their own unique bee. Next summer, all of the individual bees will be displayed together as a celebration of the unique talents and diversity of the people of Birmingham. The art work will be displayed at The Hive centre in the Jewellery Quarter. In the city council chamber. 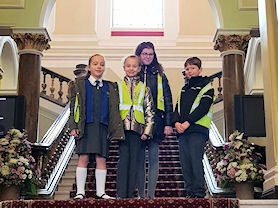 Our Pupil Voice groups visited the Council House. Pupil Voice is made up with School Council, Sports Council, Eco Team, Chaplaincy team and Travel Team. Each group shared their action plans for this academic year. We were lucky enough to be given a tour of the Council House by Julie. Councillor Moore joined us and took lots of questions from the children. 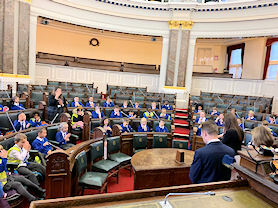 The children even got to sit in the Lord Mayors chair! A fabulous time was had by all. 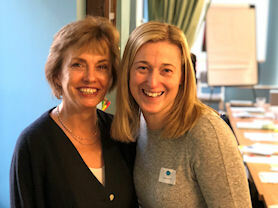 On Thursday 15th November 2018, our RWI Phonics leader and Headteacher travelled to Manchester to spend the day with the author of our excellent Phonics programme: Ruth Miskin. 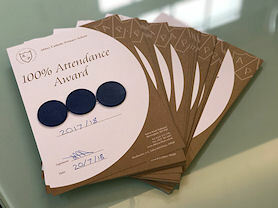 We were very proud to celebrate the hard work and commitment of our pupils, staff and parents. Working together in the workshop. Reception children were very excited to welcome an adult into school this week to share in their Maths Workshop. The children started by sharing the ‘Days of the Week’ song. This demonstrated Maths concepts such as sequencing of time, before and after and counting. They then used their beautiful singing voices to sing and act out ‘5 Currant Buns’ showing how simple songs and rhymes can support addition, subtraction and turn taking. Together with their adult the children then designed and made a maths board game, this was then taken home to share with their families. Great learning and fun was had by all! 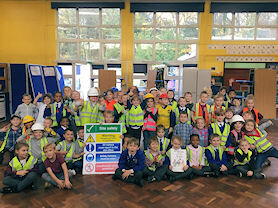 Year 2 in their construction gear. Year 2 enjoyed a fun day of designing and building new houses for the three little pigs linked to our work, What’s it made of? We thought carefully about our designs so the houses wold be strong, stiff and stable; ready to withstand the huff and puff of of the Big Bad Wolf. What a fun day we all had! Year 4 at Osborne Primary School. 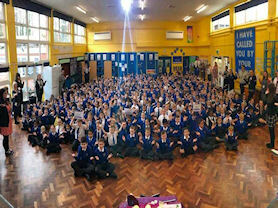 On Wednesday 24th October we were delighted to visit Osborne Primary School. 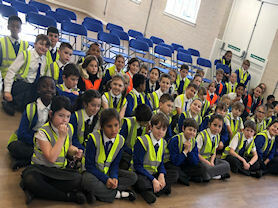 Our Year 4 pupils accepted an invitation from Osborne Primary Year 4 to watch their class assembly. We were delighted to share their excellent performance as well as visit them in their brand new school. We are very proud of our strong links with our neighbouring primary school. On 19 October, we joined people all over the country taking action against school funding cuts... we were flossing 4 funding. The aim was to show Phillip Hammond, Nick Gibb and Damian Hinds just how many parents, carers, and grandparents, like Heads, Teachers and Governors, are deeply concerned about the school funding crisis and the damage it is doing to our children. There have been 8% cuts to pupil funding since 2010, our schools and children are suffering. Headteachers say "there’s nothing left to cut!" Let’s hope that this light hearted action brings attention to a serious subject. Having a great time at the disco. On Thursday 18th October 2018 our pupils and staff from Years 3 to 6 partied the evening away thanks to our fabulous PTFA. 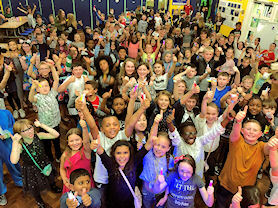 The school disco was a fabulous evening and raised money for our school. Visiting one of our local primary schools. On Thursday 18th October, our Headteacher and School Ambassadors visited another local primary school. 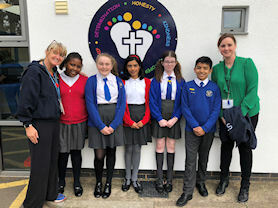 We were delighted to visit St Barnabas Church of England school, a return visit from their visit to us in the Summer term. We were delighted to tour the school and share fabulous ideas with each other. Thank you to everyone at St Barnabas who made us feel very welcome. On 4th October 2018 we welcomed an English leader from a neighbouring primary school to show our RWI Phonics Systems. As a RWI Model School for the second year running, we welcome visitors who are interested in developing their Phonics provision. Reception children at the theatre. On Wednesday 3rd October Reception visited Highbury Amateur Theatre. The children travelled by train and were very excited when they arrived at the Theatre. Each class performed a selection of Nursery Rhymes to an audience of their peers. 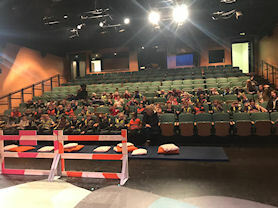 The children had a wonderful opportunity to experience not only performing on a Theatre stage by also the atmosphere of the dazzling theatre spotlights shining on them. It was a wonderful experience for our youngest pupils. Year 5 enjoying forest-based activities. On Monday 1st October, Year 5 donned their forest clothes and entered the forest area, where they learnt about similarities and differences between the Viking’s and modern Britain. Children tried their hand at making scrumptious oat bread (which they then cooked on an open fire), weaving and constructing their very own game of chequers by sawing pieces of wood. Whilst this was happening, the outdoor classroom was a hive of activity with children exploring artefacts, experimenting with Viking runes and curling up with a good old non-fiction book. Children had a fact-filled, exciting day and persevered with all the tasks they faced. On Thursday 27th September, 12 children from the Abbey Catholic Primary School went on an amazing trip to City Serve. City Serve is an organisation that serves over 600 over the West Midlands. 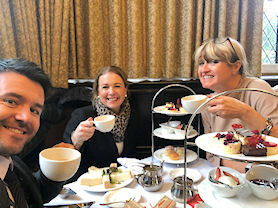 The Abbey was picked to go and celebrate their 100th Anniversary, on the same day they were launching their reducing sugar programme. We got to make and try their new beetroot and spinach recipe for Pizza bases. The pizzas were for our lunch, they were served with sweet potato fries – the healthier option to normal fries. The news were there and were filming us for the lunch time Midlands Today show. The people who were fortunate enough to get interviewed were actually shown on the news. Did you know, a bottle of Lucozade contains 16 tea spoons of Sugar? 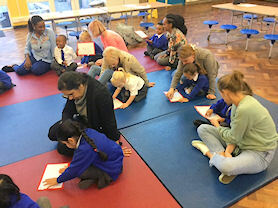 During this week, Reception Parents joined their children as their 'perfect partner' and took part in a RWInc Phonic lesson. Parents were shown how we teach saying the sounds purely, how to hold a pencil with the correct grip and how to form the letters. Lastly, children showed their parents how good they were becoming at making words on their magnetic boards, then use their finger to point and say each sound before sweeping underneath to blend the sounds together and read the whole word e.g. m-a-t = mat. 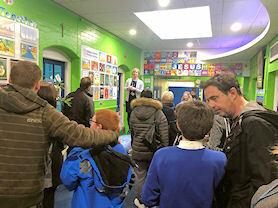 It was fabulous to have so many parents in school supporting their children - whoosh! Ms Tallon and our PCSO. 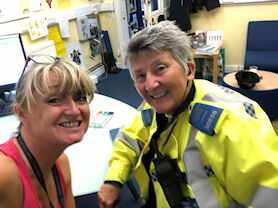 We were delighted to welcome our local PCSO at the start of the academic year 2018/19. We have booked her in for lots of sessions across school throughout the year to talk to different classes about internet safety, being good citizens in the community, road safety and the dangers of knife crime. All sessions are age appropriate and supported by class teachers. We are very appreciative of all of the hard work of our local officers and PCSOs. 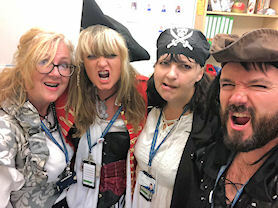 On 19th September 2018 the Abbey Catholic Primary School was overrun by Pirates! 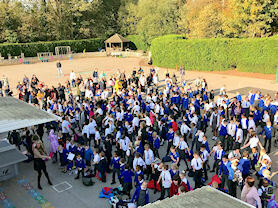 All pupils and staff dressed as pirates for the annual International Talk Like a Pirate Day and great fun was had by all! 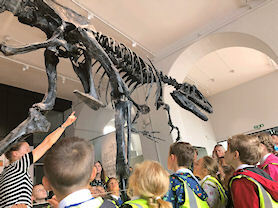 Year 3 had the chance to find out all about rocks and the history of the earth when they visited Lapworth museum. They investigated the permeability, the hardness and sorted different rocks into their relevant categories of: igneous, sedimentary and metamorphic. They studied Roary the Dinosaur and used their detective skills to deduce how he may have died. On Monday 10th September 2018 we were absolutely delighted to present gold certificates to those pupils who had achieved 100% attendance for the whole academic year 2017/18. We are incredibly impressed with the attitude to learning of these pupils which will prepare them well for life in modern Britain. Outside the school room at the Black Country Museum. Year 2 spent the day living like Victorians at the Black Country Museum. 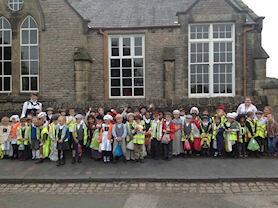 We think the whole of Year 2 agreed that they much prefer school now to Victorian school. 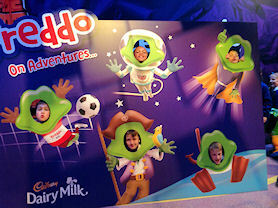 Year 4 at Cadbury World. On Thursday 6th September 2018, Year 4 went to Cadbury World in order to immerse themselves into our new topic - Chocolate! We learnt about the history of Cadbury's chocolate and how it developed over the years. We explored how the cacao beans are grown in Ghana and the journey that they go on to become one of our many favourite chocolate bars. One of the highlights of the trip was visiting the 4D experience - which was truly exhilarating! However, the best part of the trip was when we were able to sample to delicious melted chocolate in the factory with a selection of toppings! Year 1 at the Thinktank. On Thursday 6th September Year 1 enjoyed a visit to the Think Tank museum as part of their topic Who am I? 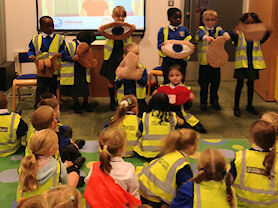 They took part in an amazing bodies workshop where they learnt all about their body parts and their five senses. We look forward to finding out more about how we use our senses in our science lessons.